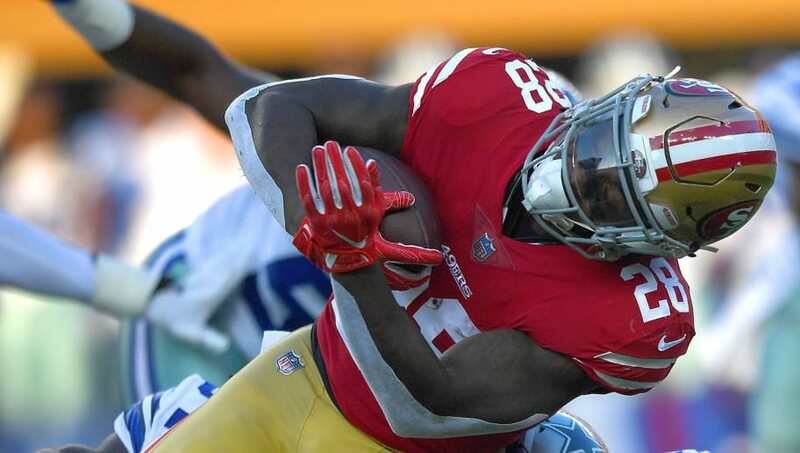 The​ 49ers faithful were given some very unfortunate news this afternoon when starting running back Jerick McKinnon went down with an injury during team workouts. Sadly, the prognosis couldn't be worst for McKinnon and the team, as he has been ​offically diagnosed with a torn ACL. This will end his 2018 season before it had a chance to start. ​​49ers fans will rightly be smarting from this latest development. McKinnon was an expensive signing for team this offseason, and was looking forward to a lot of playing time. His running and pass-catching abilities were the perfect fit for Kyle Shanahan's offense, which has featured other hybrid running backs such as Devonta Freeman and Tevin Coleman back in his Falcons days. As with many ACL injuries, McKinnon's occurred in a non-contact situation. Kyle Shanahan said 49ers' RB Jerick McKinnon hurt his knee in practice today and "we're nervous about it, that's for sure." Shanahan had a good right to be nervous, because there isn't much running back depth behind McKinnon. Although it hasn't been decided, either running back Matt Breida or ​Alfred Morris should assume the starting duties. Breida is a second-year player who only accounted for three touchdowns last season, while Morris is long way from his successful years for the Redskins. This promising 49ers offense will have to try to pick up the pieces from this devastating injury.